Home / Captain's Toolbag / It’s Time to Clean The Bottom Again! It’s Time to Clean The Bottom Again! New clean bottom paint. Look at all those acres! As you may or may not know, Dazzler recently had her bottom painted last August in Puerto Peñasco. There comes a time a few months later that you need to jump in the water to wipe down the underbelly of your cruising home. You can break out your wallet and pay the guy at the dock if you want. You know that well-meaning diver that is looking to get paid for scraping the bottom with steel wool or a paint scraper. Most boaters understand the cost of having the bottom of their vessel painted. If you are anything like me, I expect to get the maximum use from the paint. The first several times Dazzler’s bottom gets cleaned will be by me with a soft white pad. The metal parts usually have some stubborn marine growth requiring a bit more scrubbing. For the painted surfaces, I like to wipe them down with a white 3M pad that isn’t supposed to have any abrasion fibers in it. But, I have heard that a small carpet square will work also. For those stubborn areas like the prop, I use a flexible blade putty knife about 2” wide, a stainless wire brush and some stainless scrubbing pads. A long time ago when Dazzler was docked in Marina de Rey and I was still working for a living, a professional diver, Bob Williams, passed on some sage advise for cleaning the hull bottom of a boat. First he sited cleaning the bottom more frequently required less scrubbing and less time underwater to complete the job. He also indicated that the organisms that like to attach themselves to the exposed metal parts and other places on the hull have less time to get a strong foothold on the surfaces they attach themselves to. Secondly, Bob, provided me with a pattern that he deploys while doing regular bottom cleaning jobs. He would divide the bottom into sections. Port and Starboard, front to back or back to front, waterline, hull and keel. The first time I had jumped in the water to clean Dazzlers hull was many years ago. I was overwhelmed by the size of the area needing to be wiped down. Keep in mind the magnification factor while being underwater. It was huge, gargantuan and looked like forty acres. It didn’t look that big when Dazzler was hauled out during the survey when I bought her in 2003. I can remember wiping down the hull in pretty much a random pattern. After about 30 minutes I thought to myself that I was sure that I had wiped down the section I was currently doing. Nope! The first time seemed to take forever. Bob and I had become good acquaintances over the first few years I owned Dazzler. If he happened to come by the boat to clean Dazzler’s bottom while I was on board, I’d make him a sandwich or I might have been barbequing hot dogs and I’d share lunch with him. After speaking with Bob a few times, I understood the need for a cleaning pattern while underwater. Bob also described the tools that he used and how to use them without taking the paint off the bottom. The next few times I dove down to clean Dazzler’s bottom, I had a plan of attack. I first did the waterline on one side by starting at the stern and working my way along the side to the bow. All the time reaching down as far I could reach, without dropping my cleaning pad, between the waterline and the top edge of the keel. I had to learn about that don’t drop or let go of your pad thing a few more times before I got it right. Ha! Ha! Ha! The next step was the hull. So, I’d start at the bow wiping down the side of the hull. This task started out pretty easy, but by the time I had gotten to Dazzler’s beam I found myself having to split the area into two swaths an upper and a lower area. After the hull was done, I’d wipe down the rudder and then her full keel. With that side done, I would move onto the other side. Just like the shampoo bottle indicates, “Rinse, Lather, Repeat,” so too I would now do the other side of Dazzler in the same fashion. Once I completed the painted surfaces, I would get my metal scraping tools and start for the propeller. Dazzler’s propeller is a three blade fixed prop that sets inside an aperture between the trailing edge of the keel and a cutout area approximately in the middle of her rudder. I found it easiest to start on the forward facing surface and clean one blade at a time. Depending on whether your prop is a right or left hand pitched prop, I found the forward and aft facing surfaces were easier to clean while on one or the other side of the keel. While at the prop, I’d give the sacrificial zinc a check and determine if it needed replacement. Next, cleaning the thru hulls was fairly simple with a sacrificial long bladed standard flat blade screwdriver. I use the word sacrificial because accidently dropping your favorite Snap-On screwdriver into the briny deep hurts. You can dive down next to the bottom if you like to look for things, but I am here to tell you that a layer of something floating next to the bottom is like entering a dense green fog that seems to blanket the bottom and blocks out all possible sunlight and thus hiding anything concealed by its eerie science fiction cloak. I heard that a diver went into it once and was never seen again until the next Taco Tuesday at the local watering hole. I’m not a scaredy-cat when it comes to most things, but why tempt fate. Go into it or don’t go into it. I can get another screwdriver. I will add that the waterline tends to be one of the tougher areas to clean as all the floating things in marinas and anchorages like scum, oils and whatever else is floating by likes to cling to the area of the hull just above the mean waterline. More frequent cleaning of the waterline will help keep it in check. If you chose to hire a diver to clean your boat watch what they use at the water line. You will be surprised to find that they are using a stainless steel scrubber to clean the waterline. This technique will surely chew the bottom paint away from the hull. The divers use this scrubber because it is easier faster for them to get their job done. It doesn’t bode well for your paint. A thought about holding your breath, using SCUBA or a surface air supplying Hookah system. In my early days of bottom cleaning Dazzler, I used SCUBA and wore the equipment. It was not a big deal, because I lived in the land of plenty and in Marina del Rey dive shops to get an air fill were plentiful. While getting ready to depart for Mexico, I wrestled with the idea of whether to get a dive compressor of a surface air supply Hookah system. In Fact, I left the states on my first trip into Mexico without either. A dive compressor took up too much room and Dazzler just didn’t have the real estate. After trying to find a reputable dive shop in Mexico to get a clean fill without water in it was difficult. So I purchased an Air Line Diving System that was 115 volt system. Earlier in the summer, In the water getting ready to clean the bottom in Punta Santa Domino in Bahía Concepcíon before the new bottom paint. Go Go Gadget! Dazzler’s Honda EU2000 generator could easily run the system. I got one 60 foot hose and regulator to make cleaning Dazzler’s bottom a lot easier. The additional benefit was no cumbersome dive equipment, easy setup, clean and store and most importantly, I didn’t have to be tethered to a dive shop or friends with dive compressors on their vessels. Yes, I know it may sound like I am advocating cleaning the hull more frequently and to those that don’t dive their own boat I leave you with this story. A friend of mine, left Banderas Bay last year to travel to Mazatlan to leave his vessel for the summer. Upon his arrival he hired a diver to clean the bottom of his boat. The diver wasn’t underwater very long before he returned to the surface to tell my friend that he had a very bad problem. I’m not sure anyone wants to hear those words. His boat was a Hunter with a fin keel and a spade rudder. As the shaft exits the hull of the bottom it is indexed and secured in position by a Vee-strut and cutlass bearing. The lower end of the strut has a tube welded to it and holds the cutlass bearing in place and thus keeps the shaft aligned. The tube that houses the cutlass bearing and the shaft had broken free of the strut. My friend indicated that he had his boat dove in Paradise Village before he left. He had experienced some larger swells on his way to Mazatlan. He had no idea where the break occurred, but he was so thankful that he made it to Mazatlan before something bad happened. He later discovered that electrolysis was the culprit and the stray current was coming from his wind generator. Insulation from one of the wind generator wires had worn through and it was energizing all the bonded metal on his vessel. 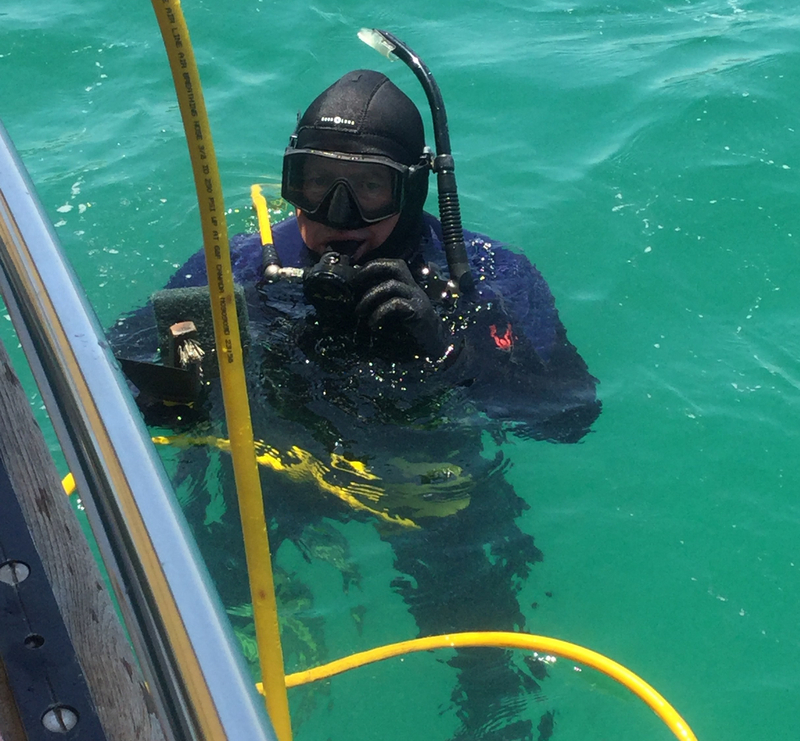 Divers hired to clean the bottom of your boat, here in Mexico, have differing levels of experience and understanding of the parts attached to the hull. In many cases far less than we boat owners. Their job is to clean the hull and move onto the next boat. While I’m diving Dazzler, I inspect and look at the thru hulls, shaft, prop, zinc, Dynaplate, and raw water intake to name a few. That way I don’t get surprised by any of the things that can happen under the water. I like seeing first hand what’s going on down there. The old adage of an ounce of prevention being worth a pound cure isn’t too far off the mark here. Boat maintenance! We all have it and we pick an chose those things that we are good at and shy away from the things we don’t particularly like doing. No one ever said life on a boat was easy or cheap. But there are some awesome tools out there that can make it easier. Pay for a diver or do it yourself, this is one job that should be done regularly. If for no other reason than to go faster when you see that other sailboat out on the water. Because we all know that if there are two boats on the water in the same area at the same time…..It’s a race! I chose to don my 3mm suit and jump in the water with a Hookah air supplied hose and regulator to keep up on this regularly scheduled maintenance on Dazzler. Yo DAN. Scotty here. Great article. Same with flying. I try and do everything on the plane myself. Where ya headed next bud? We’ll be leaving here on Sunday for Punta De Mita and then to La Cruz for five weeks of projects.